This story begins in a car, over packed with duplicative race supplies, as one naïve racer and a willing companion set off for the Green Mountains of Vermont. The contrast between the beginning and the end of the drive couldn’t be greater – at one end New York City’s rising towers of concrete, while the soaring mountains of Vermont greeted us at the other. The thing about long car rides is that you have a lot of time, too much time, to think. GMSR had always loomed as a prospective race on my calendar for years but various reasons had kept me from making the trip north. Even this season, more dedicated than ever, I was apprehensive to commit to the race. A few weeks of coaxing and support from the team and our coach Jacob Fetty, brought me here, to a loaded car in route to Vermont. Joining me for the race, Nicole (a local pro triathlete) had offered to be my “soigneur” for the weekend – assistance I would vitally need. Erwin, who’d raced Killington and the Giro del Cielo with me, would also line up for the Cat 2 race. It was shaping up to be one hell of a weekend. I was nervous, I was excited, and my confidence was growing. Our goal was to make it to the time-trial course by mid-afternoon to preview the route and for me to get a chance to really open my legs ahead of the weekend. When we rolled up to the course, it was clear how serious this race was as full teams of elite riders rolled through. After a quick parking lot change into kit, Nicole and I joined the multiple riders already out on course for a few sighting laps. Among the elite teams riding two by two, I felt dwarfed by the magnitude of this race, but there was only one thing left to do. Time trials are not easy. I had only raced a handful of time trials this season, and had hardly perfected any semblance of pre-race rituals. 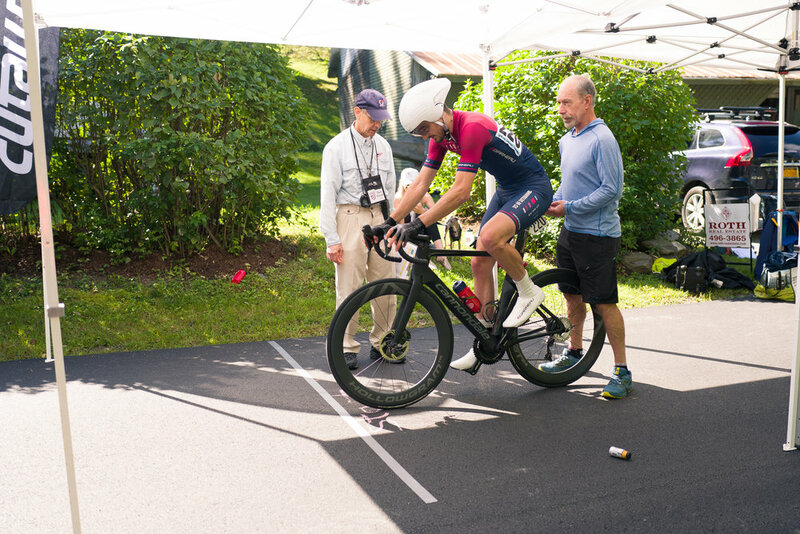 This would be a vital time-trial, a proving ground to place me amongst my competition in Vermont. However, I had a refreshed approach to stage racing – a tranquilo attitude. I was prepared, I had done the work, all I had to do now was perform like I knew I could – I couldn’t stress on the things out of my control. Despite traffic, I had enough time for a complete warmup and rolled to the start-line with just a couple of minutes to spare. Frantically, I discarded my gilet and pocket contents as I rolled up to the line. In under a minute, I would be alone with the road. As the official released me out on course, I spun up the gears but was quickly reminded that the course went up from the gun. Settling into a rhythm well above threshold, I was charging up the early slopes as my heart rate screamed up to 180 BPM. I felt great as I kept a high cadence, my mind whirring as the power continued to come easily. Pre-race, Coach Fetty had given one firm piece of advice, “it’s better to ease off a tiny bit on the climb to save power for the fast, flat sections.” Well, by the top of the climb I hadn’t let off the gas and struggled to click down a few gears as the gradient released me onto a blustery and flat stretch of road. I was all too aware that I wouldn’t have the raw power to compete with the top riders here, I likely never will in a time-trial. But what I could do was make myself the most efficient rider. Tucked low over the front, my back flat, forearms resting on the tops of the bars, I knew I could hit higher speeds for less power. Over the flat sections I struggled to lay down the same high power as on the climb, but my 30-second man was still tantalizingly close, just up the road. I never managed to wind in my 30-second man, and as I suffered on the false-flat to the finish, I was passed by the rider behind me. After gasping for air for a few minutes, I pointed my bike back towards the start and slowly rolled the course in reverse. Looking at my time, I was pleased with my effort. Based on the results from the past few years, my time was competitive for the category 2’s. Regardless of what the results said, I felt like I had ridden a solid time-trial with little room for improvement - it was nearly the best I could give. Green Mountain Stage Race is unlike any other race I’d competed in, both in the magnitude of the event and the level of competition. When I wasn’t actively racing, I was think about the next stage and how I could be in the best possible shape on the start-line. Back at our accommodations in Montpelier, the capital “city” of Vermont, I had no sooner showered than put my legs above my head and begun to recover from my TT effort. At Millersburg and the Giro del Cielo, a criterium stage followed the TT by just a few hours, leaving a short window for a nap or some active recovery. GMSR was quite different in that I was completely finished with racing for the day by noon, having only raced for 15 minutes. How much did I need to eat? How long did I need to lay around and rest my body? With a massive weekend on tap, taking the appropriate steps to recover would be vital to my survival. Luckily, MotivNY provided me with Normatec boots for the weekend to expedite the movement of lactic acid out of my system and encourage strong blood flow to my sore and tired legs. Despite three stage races in the 2018 books, this felt like a new experience. In all my other race weekends, I still felt the tug of real life and could never just be a bike racer. But here, in Vermont, that’s all I was, a bike racer. Stage Two was my opportunity for a result. On paper the circuit had a challenging enough climb to cause separation, but it might end in a sprint. I felt confident that I could sprint amongst the best of the Cat 2 field, all I had to do was pick my wheels carefully. I hung at the back in the early stages of the race, enjoying some light conversation with my peers to settle my nerves. When the pace kicked up with attacks on the front, I tucked in and watched the peloton stretch into a long, thin line as riders sought shelter in the wheels. However, unlike in the Cat 3 stage races where the pace would slow after each successful breakaway attempt, these guys kept on the gas. When the pace finally began to slow, I used my opportunity to find space and move up. As I moved up in the gutter, I felt my tire slowly going soft beneath me. At first my mind refused to accept the reality of the situation. Here I was, on flat, open roads slipping out of the peloton less than 15 miles into the race. I pointed to my rear wheel, alerting the Look NRS mechanic to my woes. Coming to a stop, I quickly dismounted and shouted my wheel specs (disc with 140mm rotor) to the mechanic for a rapid replacement. Trying to stay calm, I pulled my rear wheel as the mechanic bounded over and quickly went to work fitting the new wheel. It wasn’t a perfect match, but it would get me back out there. Now I wondered, how far up the road was the race? A quick push back up to speed and I was rolling once again. Not long after, the Look NRS car was just in front of me, offering a much-needed assist back to the field. As he accelerated up to speed, I tried to stick tight to the bumper. If I ever needed confirmation that I was in a real bike race, this was it. Here I was, inches behind the bumper of a station wagon loaded with spare bikes and wheels, drafting back to the race at well over 30 mph. This was bike racing. Adrenaline fueled, I was back in the race. Hopefully that was the bad luck out of the way, my mind shifted to the upcoming KOM. How hard would the peloton hit the climb? Would the field split and force me to chase? I responded to the shifting pace as the race ebbed and flowed, my legs spinning easily as we began to climb. But, as I learned in Killington, the best of days still need a bit of luck. As we approached the KOM on the second lap, riders touched the ground just in front of me. The field scattered like a school of fish fleeing a predator. I grabbed my brakes for all they were worth but I soon found myself in a heap of bodies and bicycles. When I retrieved my bike, I fumbled with the chain only to discover that my chainrings had been knocked loose. I shouted to the neutral mechanic that I needed a bike. As he helped riders back on their bikes, I discovered that the two riders who had fared the worst in the crash were friends, a sight you never want to see. 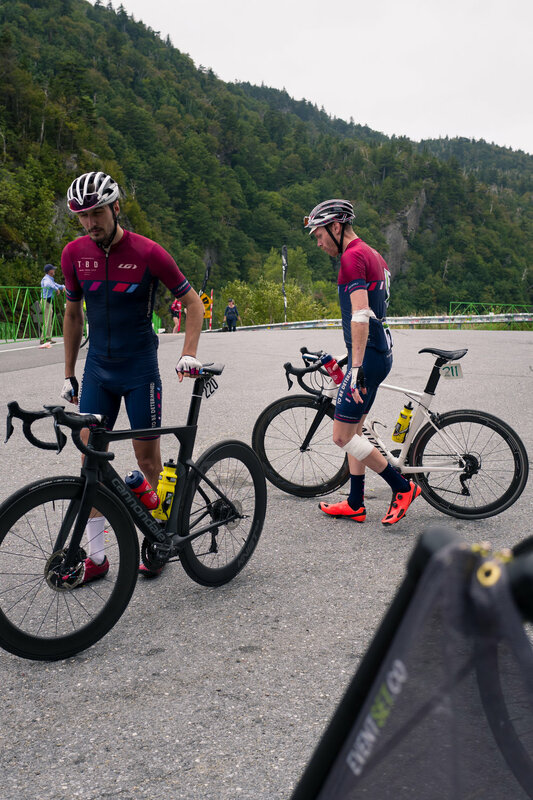 NYC rider Andrew Weigland was wincing in pain beside the road, a race doctor by his side. The other rider, a promising young gun from Lees-McRae, struggled to get up from the pavement. Hopping aboard the neutral bike, I rolled towards the finish line. Joined by three other riders, we rotated well as our bodies worked through the soreness of the crash. We chatted about what had happened, and what might have been. Nine minutes. The clock was unforgiving as we crossed the line. At the finish, I suddenly felt horribly alone. I was bitterly disappointed to miss my chance at a result and any hopes of decent GC place were gone. I spun down through my gears, reconciling the events of the last half hour. Rejoining Erwin and Nicole, who had seen me looking well just over an hour prior as she handed off a bottle in the feed zone, I explained what had happened on the road. I hate the “what ifs” that linger and taunt your mind. I hate the playback of a crash, wondering where things went wrong. But I love to race. Tomorrow was another day, that was all I could focus on. With a damaged bike occupying my mind, and soreness creeping into my legs, Nicole and I ventured out for some much-needed active recovery in the town of Montpellier. Looking like a complete stage race nerd in compression socks (with ice taped to my ankle), and sharp tan lines from a season of racing, I ventured out in search of some quality food and a bit of stress relief. Despite our best efforts to keep my mind off my bike, I soon began wondering if a local Cannondale dealer could fix my crank. A quick call to Bicycle Express in Waterbury, and off we were. Bike shops in Vermont are a bit different from bike shops in NYC. The relaxed vibe immediately put my mind at ease thanks to some great shop employees, henceforth known as “the bros.” Chatting all things shop, from the latest Cannondale products to one of the bros’ epic solo win atop App Gap in a previous edition of GMSR. After the bros had fixed my bike, I felt a calmness return. My “tranquilo” attitude, which I had hoped to maintain, was back. There was no need stressing about the factors I couldn’t control; I just needed to ride my own race. You need a bit of luck as a bike racer; perhaps it would come my way tomorrow. The Queen Stage of GMSR had occupied my mind for weeks, it motivated my training and it made me question my equipment incessantly in the days before the race. I had quite simply never done a race in the magnitude of this stage, 103.5 miles with way too much climbing, most of which was up steep category two climbs. Atop a misty mountain, the race staged. We’d be neutralized for the descent and then the racing would kick off. I somehow found myself at the head of affairs coming down the mountain. Nestled between a French-Canadian and a Wisconsinite, I let my mind wander to the day’s menu. The key points in the race were taped to my stem, the start of the first climb, the first KOM, the feed-zone… my notes ran the full length of my 130mm stem. The first 20 miles of the race felt somewhat conservative, with only a few attacks going off the front causing brief stints at pace. As we neared the first climb of the day, a few riders snuck off the front. Those further back in the peloton sneered at the breakaway, joking at how futile such an effort would be. I found myself consistently near the front, often too close to the front, as we rolled closer to the day’s first test. That’s when things got spicy, as riders knew they needed to position themselves ahead of the steep Rochester Gap. As the road reared up before us, I found myself at the back of the pack having been jostled out of position. There was no time to feel sorry for myself as we chucked our chains down to the smallest sprockets and hit a 15% grade. Rochester Gap was four miles long, but the early sections forced me to dig deep sooner than I would have liked. The road leveled for a moment and I latched myself further into the group, a momentary respite. A turn in the road revealed yet another steep pitch as I yo-yoed off the back, turning whatever cadence I could manage. I wasn’t going to get dropped now. There was no way I would reconcile letting go of the group this early, so I hung tight. We rolled through the first feed zone at near walking pace, allowing me to grab a bottle from Steph. More important than anything today would be nailing my nutrition, from the various drink mixes in bottles to the order in which I consumed bars, gels and even the mini ham and cheese sandwiches stuffed in my rear pocket. My reward for chewing my stem up Rochester was a magnificent descent, where simply coasting would yield speeds well north of 40 mph and the occasional dip over 50. Unfortunately, the excitement was over in just eight minutes as we plummeted off the backside of the gap. A long, straight road awaited us at the bottom where most racers took the opportunity to have lunch. I, being inexperienced in such a strong field, took a mistimed nature break and was forced to chase back through the cars. Luckily, a nice draft from the Look NRS car brought me right to the back of the field. Approaching Middlebury gap, I positioned myself near the front in anticipation of the challenging climb. I was riding blind, unaware of how the climb would play out. What I did know from talking to other riders, Middlebury could be decisive. According to my stem notes, we were on the climb, but the mild gradient was deceiving beneath our bikes. I may not have known what was coming, but I knew I couldn’t be lulled into a false sense of security on these lower slopes. Sure enough, the road rose before us with double-digit gradients. Before long I was pedaling 60 RPM in my lowest gear and losing ground to a select group who continued to spin up the climb. Luckily, I wasn’t entirely out of contact and crested the climb among a strong group of riders. To the best of my knowledge only a handful of riders had escaped up the road with plenty of the race left to catch them. We chased, we looked at each other, we chased, we looked at each other. But the lack of cohesion meant we weren’t going to regain contact with the leaders. My goal had been to make the final selection, I felt confident knowing I’d done as much as I could in the race. Now, as cramps began to take hold in my calves and quads, I was in survival mode. An unexpected KOM sapped more precious resources from my body as we closed in on the final climb of the day, App Gap. I’d feared the looming mountain, knowing it would be a test beyond anything I knew - and then I realised how little I truly knew. I sat near the front of the group as we kicked into the climb. I was hurting, but it was clear I was no better off than my companions. Up the road we could see the shattered remnants of the lead group, shedding riders as the gradient picked them off one-by-one. They grunted as we passed, a mutual acknowledgement of our collective suffering. Switchbacks revealed yet more mountain as we weaved up the slope, steepening as we climbed on. Our group had faded to just a handful of riders as I felt my legs start to falter. Staving off a cramp, I rose from saddle and stood on the pedals, stretching my legs in an attempt to keep with the pace. Eventually, I was alone on the mountain. There may have been riders scattered ahead and behind me, but my singular desire to finish had given me an extreme tunnel vision. A sign, 500 meters to go - how bad could it be? And then, looming high above me I saw the finish. How could I possibly climb up there in just 500 meters? The wall hit me like a cab blowing a red light. All momentum I had (which was nearly none) dissipated, and I was forced to rise from my saddle to keep the bike moving. Riders from the lower categories and the Gran Fondo were walking their bikes just ahead of me, some had even removed their shoes to avoid the click-clack walk of cleated shoes. I continued my push for the finish, seemingly no closer than before. Eventually I clawed my way over the line, drenched in sweat but in awe of the achievement. My finishing place didn’t matter atop App Gap - there was pride in finishing. Erwin soon joined me atop App Gap, as did super-soigneur Nicole who came bearing refreshments. Early in the stage, Erwin had suffered a small crash and finally had his wounds attended to nearly 100 miles later. It had been an absolute brute of a day, but we had survived. I was nervous. The crit looked super technical on paper and the mercury was rising as the 1pm start time drew near. A fast, hot, and humid hour in the heart of Burlington was all that lay between me and the finish of GMSR. I wanted to finish well, but I had no intentions of a top place - survival alone would be nice. A hurried warmup did little to calm my nerves, but I arrived at staging early enough to get a decent position on the start line. That is, until the promoter called up the top-10 on GC and all of the leaders’ jerseys to the front of the pack. I found myself staging near the back on a technical crit, perhaps I should just tail-gun after all? Within five laps I was mixing it up in the top half of the field, getting a feel for the course and saving energy in key areas. Technical corners with sewers and grates kept me on my toes and my mind fixated on the task at hand. This was the final flurry of my season and I was feeling strong. Eventually some attacks rolled off the front and the race picked up in intensity. My legs and lungs screamed, my mind persevered. I could feel my heart pulsing in my mouth as sweat drenched me from head to toe. I was pinned, but there was no stopping. I emerged from the depths of suffering and resumed my hunt for the top ten wheels. My mind was sharp, and my confidence grew each time we flew through the fast-final corner on course. I felt in control as I gained positions in the group, following smooth wheels towards the front. The speed continued to ramp up, but I felt better and better. Diving through the corners at full tilt, I realized - I belonged in this group. For months, I had been apprehensive about GMSR. I put the race on a pedestal and feared the scale of the event. But here I was, after months of dedication and perseverance, nearly grinning at the pointy end of the final stage. No time for distractions as we jostled into the first corner on course, the road pinching the group into a narrow line. I held my own as I came dangerously close to running my bars against the barriers. Putting down a few strong pedal strokes to move clear of the danger. The difference between a result and ending up the hospital was increasingly slim as the laps clicked down to three to go. I was sitting in the top ten wheels as we rounded the final corner - the podium had already been decided by a break up the road - but I was hopeful for to get near the top five. I followed wheels, accelerating in the saddle before kicking with everything left in my legs. A loud snap came just a handful of pedal strokes into my sprint. My pedals wouldn’t turn as my chain jammed, wrapping itself around my crank arm. An exasperated yell escaped my lungs as I coasted over the line. It was still a decent result - I would later learn 13th - but I was immediately crushed by what might have been. Once again, bike racing had reared its ugly head and served up an ice-cold dish of bad luck. As the disappointment faded and the lactic acid took hold, I reflected on the weekend as a whole. What it had taught me would go far beyond bike racing, and well beyond this season. Despite not achieving a truly notable result, I was fulfilled by the accomplishment. Even though I’d made countless sacrifices for months, it was all worth it. To some, all they see is a bike race - a bunch of skinny guys and gals in spandex pedaling circles on the weekend - but too categorize bike racing simply as an athletic endeavor would be to sell it short. GMSR sits alone in a category of bike race unlike anything else. It will push a racer beyond their known limits (unless you’re a casual World Tour racer like Nathan Brown). As road cycling seems to slip into decline in the US, events like GMSR reveal the true character of the racing pelotons - and the spirit of racing. Why do we drive several hours each weekend to suffer on our bikes? Why do cram 15 hours of training on top of our full-time jobs each week? Because cycling makes us stronger. It’s not all physical, despite our vain search for the perfect sock lengths and meticulous tan lines, yet, it’s not all mental either. Cycling plays out like a game of chess - at over 25 miles per hour on two wheels shod with skinny tires - and exudes extreme physical demands on the body. On Tuesday, as I returned to the office exhausted and with heavy legs, I was buoyed by a new confidence. At GMSR I dug deeper into my being than ever before and came out all the better for it. Reflecting on my season, bike racing taught me a few hard lessons, but for the few things it took, it always gave something more in return. Earlier this year I wrote, “despite how much you give it, bike racing owes you nothing.” And as that still may be true, I know that bike racing will always have something to give. The story of the 2018 Green Mountain Stage Race in Vermont. Featuring all of the suffering, joy, bad luck and happiness that bike racing has to offer.